There's no confirmation as to what the company will announce, but given the recent chatter in the HoloLens community about an impending HoloLens 2 release, it's highly likely that the event will either deliver new details on the release or perhaps even deliver the public's first look at the new device. 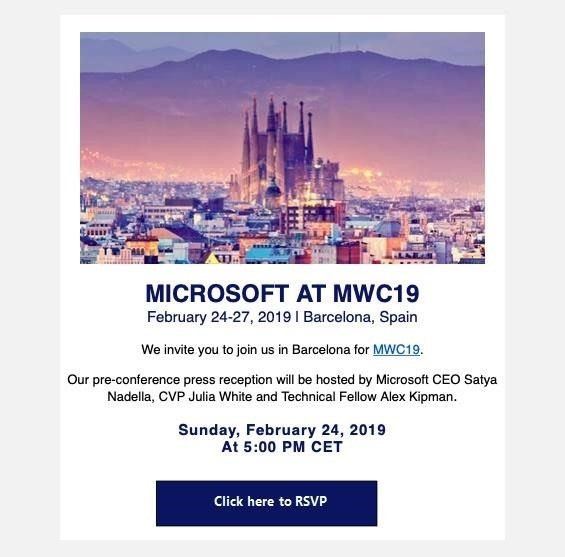 "Our pre-conference press reception will be hosted by Microsoft CEO Satya Nadella, CVP Julia White and Technical Fellow Alex Kipman," reads the invite for the event, which will take place on Feb. 24. Is this the second coming of the HoloLens that so many have been waiting for? Microsoft isn't saying, but there's a strong chance that we'll at least get more detail, and perhaps even a look at the device Microsoft hopes to use to compete with upstart competitor Magic Leap and a range of other augmented reality devices entering the market. Do we know if this event will be live streamed?